RMS 19 is around the corner and will be released this fall. The new RIS engine works different than the RMS 18 reyes and ray tracer hiders but these old hiders will still be available. So why not write an article on how to get decent quality images out and how to streamline your workflow. Some of the workflow tips will still be useful in RMS 19. What are my render options while working on a scene? There are three ways to get your previews rendered. You can use the internal renderer. The interactive re-render option or the PRMan external renderer. The internal renderer: Works just like the Maya renderer or Mental Ray. My biggest problem with this method is that Maya becomes unresponsive while rendering. You can stop the render process by pressing Esc but you can't modify any parameters in Maya. You can only twiddle your thumbs while waiting. The re-render option: In this mode the renderer will constantly update the image while Maya stays responsive. You can change settings on the fly and see them change in de Render View. I have seen people using it successfully. Personally speaking I do not have a great experience with it. It does sometimes freeze Maya as it is still a process within Maya. This can really disrupt the workflow. It works best when you output your image to "it" and not to the render view in Maya. The PRMan external renderer: In this mode the scene gets exported en queued up in the Local Queue manager (or the farm if you have one) and then rendered by RenderMan Pro Server. The big benefit is that it is an external process which won't block Maya from being used once the scene is launched. It is slightly less interactive than the re-render mode but is very stable. Since it uses the Local Queue it is possible to queue up multiple renders. It also uses "it" which is superior image viewer compared to the Render View. RMS 18 has two modes of rendering: reyes or ray trace. Reyes is a hybrid renderer (used to be scan line only) and the other mode is of course a full ray tracer. They both produce excellent results but they respond slightly different to the quality settings. 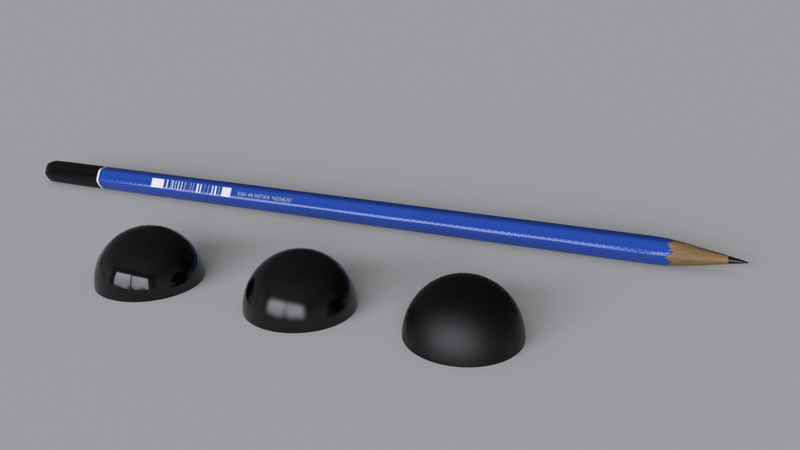 I have made a test scene with a pencil and three black spheres lit with an HDR map. 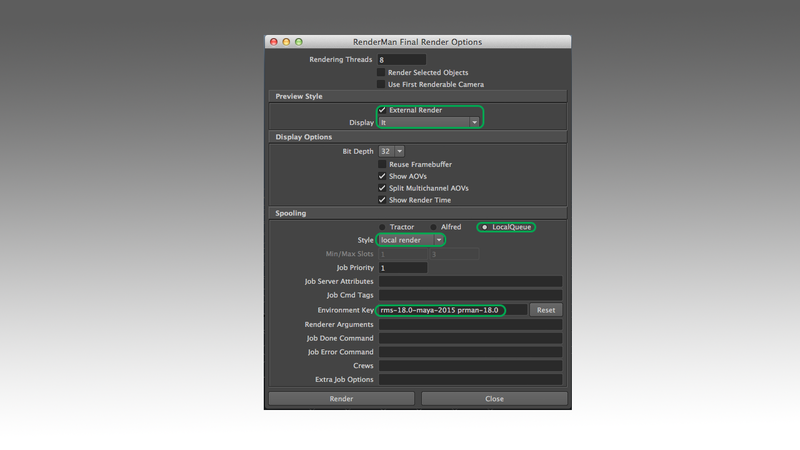 Image1: RenderMan Globals: Quality tab and advanced tab. (click image to see full res). Under the advanced tab you can choose your render mode (or also called hider) (right window on image 1). When choosing reyes there is not much else to set in the hider tab. When choosing ray trace it is possible to tweak some settings. I prefer the adaptive path tracer. When you check incremental the image will start rendering noisy but will improve over time. I really like this as you get immediate results but you can also wait for more details to show up while it continues calculating the image. It allows you to judge the image quickly so you can start making tweaks. The image keeps rendering while you make those shading tweaks in Maya or when updating texture maps. (but does not incorporate them until the next render). For me it means I can do two things at once. 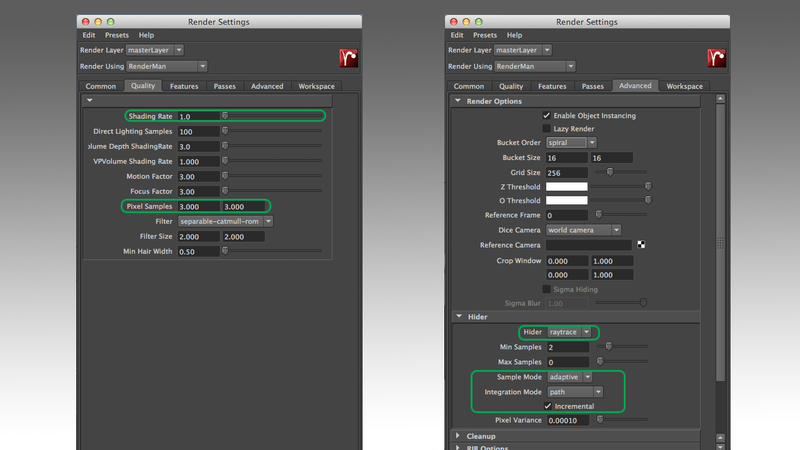 To set up you external renderer you need to adjust some setting in the RenderMan Render Options. Check the external renderer and choose "it" as your image display or your image viewer. Choose local queue and local render (unless you have a complete render farm at your finger tips). Set the environment key to "rms-18.0-maya-2015 prman-18.0". Important: You do need to have the RenderMan Pro server installed for this to work. How to simply adjust quality. The next section shows some differences in quality. Make sure to click the images to see the actual differences between them. The blurred reflection on the spheres and the text on the pencil are good places to look. When you lower the shading rate, the quality will improve. Production renders are always on a shading rate of 1 or lower (like 0.5). This will increase rendering time. On the next image (Image 4) I lowered the shading rate to 0.1 which makes the small letters on the pencil very readable but the render time was 7 times as high as shading rate 5. The quality controls work a bit different when you are using the ray tracer. In general you can leave the shading rate on 1. It is in fact the pixel samples which control the quality of the image (check right window on Image 1). You can see on the next image (Image 5) that the ray tracer shows the texture maps more clearly but has more problems with noise and anti-aliassing. It is very noticeable in the blurred reflections. Increasing the pixel samples will render better quality but will increase render times exponentially. On the next image (Image 6) we can see that 4x4 pixel samples is enough for a still image without depth of field. It is very comparable to the high quality reyes image.Once you start adding movement or shallow depth of field it needs much more samples to get rid of the noisiness. As you can see, both the good old reyes and the newer ray tracer produce excellent results. I tend to lean to the ray tracer as I like the incremental path tracer. It is just great so your image improve over time. It is a bit slower than reyes though but delivers very sharp images when the pixel samples are set correctly.